The report was published by the Umwelt Bundesamt, the German Federal Environment Agency. It presents the results of a study on the environmental impact of three titanium dioxides, including two nano-sized ones. The conclusion? Nano or not, under the effect of UV radiation, TiO2 (which is widely used in cosmetics, especially in sunscreens) is toxic to wildlife. The agency also denounces the underestimation of the environmental risks related to its use. This project investigated the eco-toxicological hazard of two different sized TiO2 nanomaterials and one non-nano sized TiO2 reference material to organisms (water flea, fish embryo, earthworm) inhabiting different environmental compartments. Different effect levels (respiration, mobility, mortality, reproduction, embryonic development) were considered under relevant exposure scenarios. Conclusion: the tests revealed that especially solar radiation has a strong influence on the toxicity of nano as well as non-nano scale TiO2 materials. 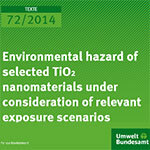 • See report entitled Environmental hazard of selected TiO2 nanomaterials under consideration of relevant exposure scenarios, Umwelt bundesamt, October 2014.